A Nice Easter Egg about blizzard's game, HearthStone. how is the item used ? Reward for a rare 90 follower mission in your garrison. 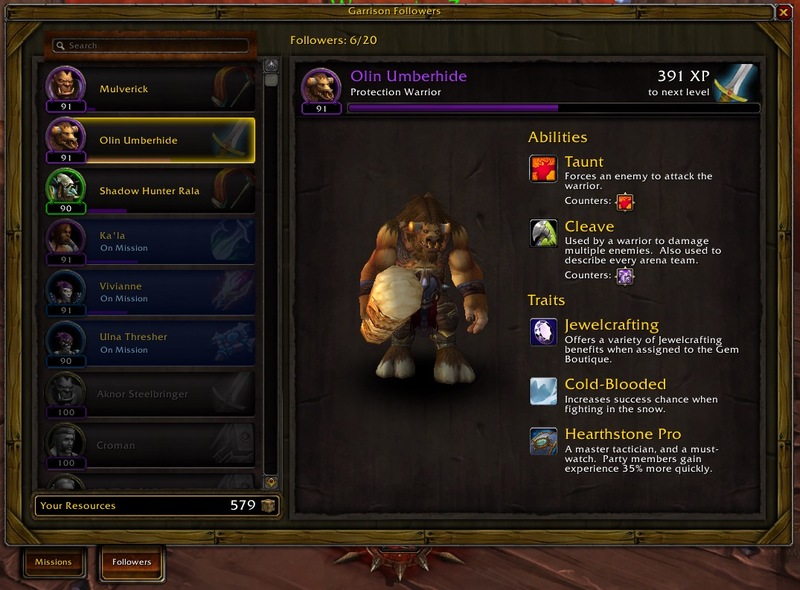 When used on a follower, this replaces one of the Traits your follower has. 6.2 - You can choose the one being replaced now. This give the Hearthstone Pro trait - "A master tactician, and a must-watch. Party members gain experience 35% more quickly." Alliance players get this item from Hearthstone Tournament and Horde players from Hearthstone Tournament. This is now usable! I'm glad I left mine in the bank "just in case". THIS BOOK DOES NOT REQUIRE A LVL 100 FOLLOWER! Gives 35% more experience to the party the follower is in. You should use this item on a low level, low quality follower. Once followers reaches level 100, they will keep getting experience to become first of rare, and then of epic quality. So, using it on a level 100, epic quality follower would be wasted (unless you put that follower on a mission with other followers). You have to be careful with this item. A trait will be replaced without any warning or confirmation. I lost my Engineering trait this way, so I was not too happy, having engineering as a profession. The follower must be available, the item isn't usable when they are away on a mission. Be aware that Hearthstone Pro only replaces the traits, the follower keeps his/her abilities. An example from my experience: I used this item on Weaponsmith Na'Shra, she still has her Recklessness ability, but lost the Blacksmithing trait. 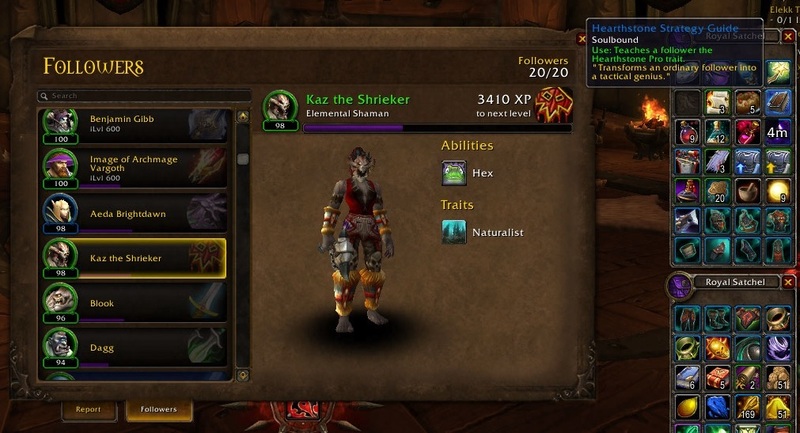 The main issue here is that there is NO warning that it will replace a trait like when you place a new enchant over an existing enchant or you swap out a gem in a socket of you gear. If there was I would not have used it on the only follower obtained through questing in all of Draenor with a specific profession trait. I assumed it would add a Bonus trait in addition to the existing traits, not replace a trait. I know that getting an Inn to level two lets you choose professions traits for a follower. 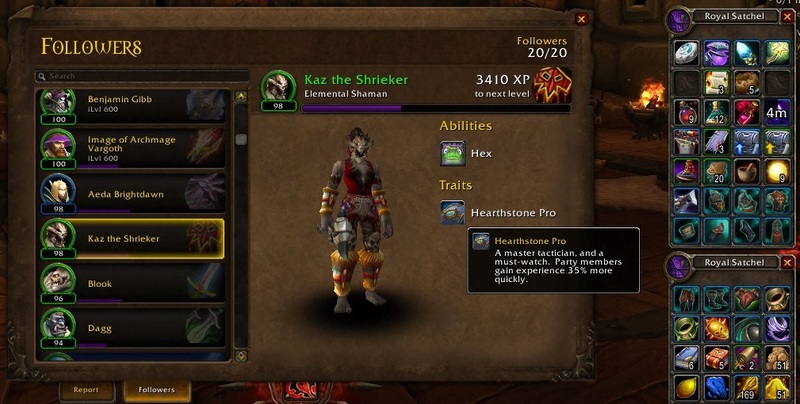 That doesn't lessen the fact that this item and the Hearthstone Strategy Guide replace traits that many people who enjoy professions in WoW seek out on the follower that has them and before they can even upgrade their small profession building in their garrison to level two they have lost the ability to assign the follower to that building. Be warned that the trait gained from this item will REPLACE the last trait of the follower it's used on! If you accidentally write over a profession you need, use your once a week free follower recruitment at the level 2 inn to get a new follower of that profession. This item is preferably used on a follower with a profession you don't intend to use, essentially dropping a trait that offers no mission bonus for a bonus to experience for your group. So we have followers with one or two traits (Uncommon seems to be one trait, Rare have 2). If this is applied to a Rare having 2 traits, is it totaly random which one gets replaced? Kinda sounds like the only logical follower to place it on is a single tait profession one you'll never have need of. Just to be clear, this is not an upgrade, this is just a change of your follower's trait. Somehow I got it in my head that using this on a green follower would improve him to a blue quality - maybe I'm not very smart. In any case, that doesn't happen, it just takes away whatever ability he does have and replaces it with this one. Edit: changed "ability" to "trait" for accuracy. Thx TrutusBalnazzar. Best to use this on an uncommon follower. It increases experience gains by 35% but REMOVES an existing trait to do so. To apply this trait to one of your followers. Open your Garrison report from the map table in your garrison. click the followers tab at the bottom, then right click Hearthstone Strategy Guide and apply to one of your followers that aren't in a mission. Hearthstone Pro is the same as Extra Training, and they can stack with each other or themselves. It also affects any Bonus Follower XP mission reward, from completing a mission successfully. It will not show in the rewards box before the mission, but it will show as floating combat text in the mission report, when accepting the reward after the mission is over. To expand upon a couple of other comments/replies, use this on an uncommon (green) follower with a useless single trait, because you know what it will replace. Ideally one that's level 90, so the follower will benefit herself the whole way up. A higher quality follower with all useless traits would also work, but those don't grow on trees (plus she wouldn't receive the benefit for as long). Do not use this on Nat Pagle! He's the only follower in game with fishing as a skill, so hes the only follower that can be assigned to the fishing shack. If you re-roll his traits, he'll lose fishing, and you'll be forever fishermanless! I haven't seen it in a past post so I figured I would share the fact that this mission is repeatable. I have only seen it twice on one of my characters. I got one when I only had 5 or 6 followers and again now that most of my 28 followers are lvl 100 and almost all at least rare now. After using this item on 4 different toons; I have concluded that it replaces the primary "Profession" trait, like engineering, tailoring, herbalist, etc... So as previously mentioned do not use it on a character that has the profession(s) that you will need to boost the buildings in your Garrison. It does grant your party members that travel on a mission with your followers, that you apply the Hearthstone Strategy Guide to, with a 35% Experience Boost in addition to the XP bonus assigned to any of your missions. ~ Peace! In terms of mission success at max level (at epic 100), this item actually hurts you in many cases if you replace a trait that would otherwise give a % increase to mission success. I currently have three of these banked, and plan on using them on the uncommon followers whose profession bonuses I will never use. This way I'm at least getting those followers leveled up faster and they won't feel like worthless profession followers sitting in the inactive pile. There are a lot of complaints and confusion about this item, so I would like to show images of how it works. Is it possible to get this item more than once if you overwrote the trait with Dancer? Still unclear on item - it does replace without warning. Blizz lamely tell you to get another follower with the ability you lost. Have said they should make clear that it REPLACES and not just teaches. While this can't be used on a follower that is on a mission it can be used on a follower that has been de-activated. Just confirming this actually replaces a totally random trait - not the primary or profession trait. I have used one previously on a different toon and it replaced the first (profession) trait. This came up for me again, and as I already have a Jewelcrafter I decided to use this on my epic L91 Olin Umberhide, hoping to replace Jewelcrafting based on some of the comments I had read here, and what I experienced last time. Sadly no. The Supreme Manual of Dance suffers with the same ambiguity. Blizzard need to make the tool tip more precise as it is currently open to misinterpretation, and subsequent disappointment. I raised a ticket and was informed both items are working as intended. Actually Blizzard, the in-game item should be explained clearly "in-game". Players fumbling in the dark and trying to understand how something actually works, and figure out if it's broken or not does not make for great player satisfaction, and it means you failed somewhere along the way. -a reference to the hearty (and often spammed) Greeting message of the Paladin hero in Hearthstone, Uther Lightbringer, which has taken on a memetic nature of it's own among the community surrounding the game. This book is next to worthless. The it's a trait not an ability, thus it isn't very effective at doing whatever it supposed to do. It appears that it is best to not use this item at all. This buff can stack with the extra training buff. I uploaded a screenshot currently awaiting approval. Warning: It can replace ANY trait not listed above. Profession traits like Blacksmithing, item-added traits like Dancer, and non-permanent traits that are initially guaranteed on a follower CAN be replaced. The same is true for other trait-replacing items, like Follower Retraining Certificate, Follower Trait Retraining Guide, and Hearthstone Strategy Guide. If you try to use this on Blook with common quality (green), nothing happens. You will get error saying "That follower has no available ability slots". I have only tested this 3 times so I can't guarentee it, but it seems a follower cannot have both Hearthstone Pro and Extra Training at the same time or 2 times Hearthstone Pro. RE: "Teach a trait" in Blizzspeak actually meaning "replace a random (possibly irreplaceable) current follower trait"
For Cust Support to say "we have no ability to change... " is, quite simply, Weasel Words for "we have no WILLINGNESS to change this"! They can change all sorts of more complicated ingame events and benchmarks... race change, class change, replacing lost or accidentally vendored items... WTF is so hard about fixing this backstabbing BS. AS you have probably already guessed by now, I am just one more poor fool who tried to upgrade a follower which is the only one available with one of my main's professions. As someone whom has put in the effort to have all 11 character slots on the realm filled with level 92 and up toons (incl. 3 100s) each with at least a level 2 garrison, I am a great deal more than "a bit" peeved. This shows a clear lack of integrity on Blizz's part! They screwed up, left off a warning, and instead of "manning up", admitting fault, and fixing it, they blow us off as if we are nit-picking. For a comparison, think about them giving us TWO HOURS in which we can trade raid items to other members of a raid group. Think about them giving us a dialog box with delete confimation for every GD toon we have in order to delete the 10th anniversary toy item once we have used it on any toon to place it in the Toy Box. How do you know when they are lieing... their lips are moving. Recruit 5 "Scavengers" :(never deadly minion, coz no mission) and 5 "epic mount" cover spell possibilities with those. Cannot be used on a follower that already has the Hearthstone Pro trait. This ! @#$ needs to have a ^&*!ing warning label on it. Someting in the lines of "Using this item on this character will lose his/hers ability - are you sure you want to go through with it?" How about they just give you the choice what trait you want to replace? would that be so hard? Wouldn't that be more fun if you can actually manage your followers that way? As of 6.2, you can select the trait to replace. Since you now have control over which trait this replaces, you definitely want to give it to someone with Extra Training. Ideally someone whom you want to keep around for a while, e.g. a 675 epic follower with only one weak trait (which you will replace). Sadly you cannot give it to someone who already has Hearthstone Pro. I believe the best use of this item is for Harrison Jones and/or Oronok Torn-heart for leveling new followers gained from the Inn/Tavern. If you max Harrison Jones' item level, his Mentor trait will grant anyone else in his group an item level of 675 and be useful in the highest level missions. Oronok's Demonic Knowledge trait helps to increase your chances of mission success. If both Harrison and Oronok accompany a level 90 follower on a few high level mission they can easily level to a 100 epic follower in a couple of days. 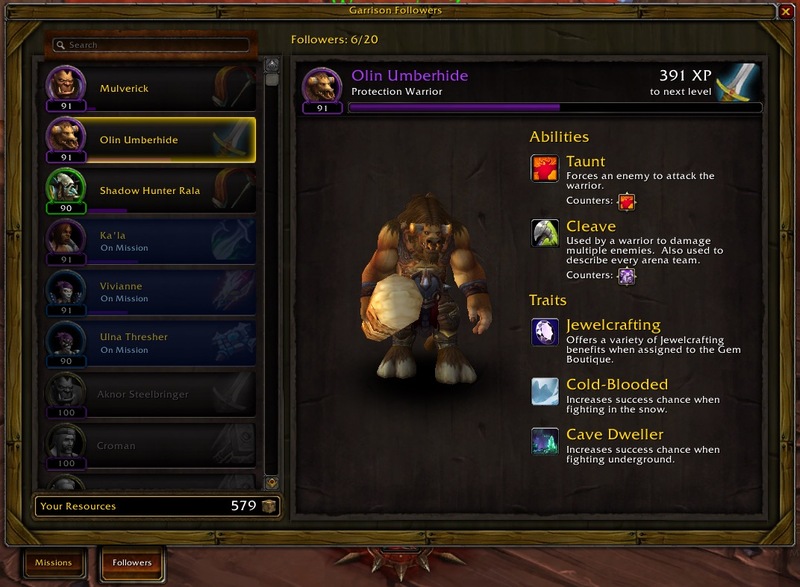 As of patch 6.2, you can choose which trait to replace so just choose the trait that is the least desirable. For Harrison Jones this is an easy choice as you probably want to keep the Extreme Scavenger trait. Written by a joint team composed by Grim Patron, Warsong Commander and Face Hunter. I just used one of these for the first time in ages (a couple years at least) and it's been changed. I right-clicked it, and the traits of the displayed follower highlighted and I was able to CHOOSE which trait to replace! No longer are you subject to the whims of the RNG! Use: Teaches a follower the Hearthstone Pro trait. Another trait will be lost in the process. "Transforms an ordinary follower into a tactical genius."